According to Cisco’s Visual Networking Index (VNI), by 2020 82% percent of all internet traffic (both consumer and business) will be video. To remain competitive, businesses will have to produce some type of original video content as part of their marketing strategy. While there are many professional video services available for this purpose, the cost of professional video production is prohibitive for most small businesses. Fortunately, there is an alternative. All you need is a video camera and the know-how and you too can produce a professional looking video to promote your products and services on the web. Whether you’re wanting to capture a family celebration, or produce a video to promote your products and services on the internet, the process will be the same. Every successful video begins in the pre-production phase. Before the professionals shoot a video, they use a storyboard to plan out all the action. The storyboard is a visual representation of how a video will unfold from one shot to the next. If you need help with creating your storyboard, there are lots of examples and storyboard templates available for download, which you can then print off and use to guide you through the production of phase. While many videos are captured on a smartphone, most mobile phones won’t give you the same high quality visual and audio as a video camera or camcorder. Nikon manufactures a popular range of Digital SLR Cameras and there are many other brands available online and in the bricks and mortar stores where you can also get advice on which video camera is best for what you want to do. Use a Tripod. The professionals use a tripod to stabilise the camera so it doesn’t produce shaky images. This is particularly important when filming outdoors. A tripod can also make it easier to shoot from a difficult angle. Making a Product Video. The young woman in our stock photo is shooting a product video and these can be very boring to watch unless you’re willing and able to showcase your personality. 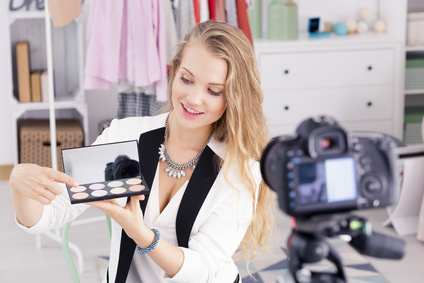 The most successful video bloggers make their videos more interesting by actually doing something, for example, applying the beauty product while they talk about it. Capture a variety of shots. There are times when capturing video from just one angle is appropriate. For example, when filming a product like the young woman in our stock photo (see above). But if you’re telling a story, capturing all the action from different angles will make your video much more interesting for the viewer. In the movie business, the wide angle shot is known as the Establishing Shot and it shows the overall scene. Medium shots often include one or more subjects. Close-up shots can be cropped at the head and shoulders like a portrait, or an extreme close-up of only a part of a person or subject. After you shoot your video, you’ll need to edit the footage on your Mac or PC using video editing software. If you’re technically savvy, you can download basic video editing software for free or spend a few bucks and purchase the more advanced software. If you’re a complete novice, there are user friendly versions out there on the web but you’ll have to pay some money to download these.